There is no doubt that the American news media has impacted my perception on the outside world. A few years ago, I went through a “news junkie” phase. CNN, MSNBC, Fox – I watched them all, devouring the headlines. Every day, there seemed to be some new and unavoidable catastrophe which would soon befall us all. (Michael Jackson’s death is what finally ended my news addiction. I heard “Billie Jean” so many times that I began singing it in my sleep and finally decided “enough is enough.”) When I was young, my mother forbade me to watch the news. She justifies her decision by stating that I hardly talked but always listened – absorbing everything. (Ultimately, I believe that she was right in her decision. Despite her precautions on the news, one of my first memories is asking my parents what “war” was and being confused by their floundering answers.) This slowly began to change starting in 2000, with the presidential election, and eventually led to news addiction I described earlier. I think that the influence of the American media is perhaps the most evident with my former ideas on Iran. Growing up in South Carolina, I had never personally met any Iranians, except for some creepy people online. Based on the news media, Iran seemed to me to be a scary place – full of Holocaust deniers, America-haters, uranium enrich-ers, and women forced to cover their heads. But, I knew that I had an ignorant perception of this country. While abroad, I had met several Iranians, who were nothing but nice and accepting towards me. In my book challenge, I wanted to read a book that would show me the depth of Iranian society and to convert the one-dimensional image I held of Iran into a multi-dimensional one. 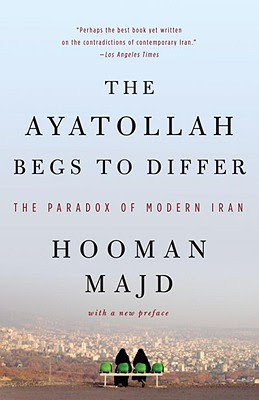 I found the book for which I was searching in The Ayatollah Begs to Differ: The Paradox of Modern Iran by Hooman Majd. The author is an excellent cultural ambassador for Iran, self-describing himself as both completely Iranian and completely American. The son of an Iranian diplomat, he spent most of his childhood in the western world. I feel like I learned several different insights into Iran, including cultural tidbits, which I would like to share. I hope that the following ramblings might encourage you to also read this book and join into this discussion. The author delved into two cultural practices which I found interesting: ta’arouf and the concept of the “Persian Walls.” I think that there is even a possibility that one can actually compare these two cultural practices with those of the culture of the southern United States. The first is the concept of ta’arouf, described by the author as “a defining Persian characteristic that includes the practice, often infuriating, of small talk, or frustrating and sometimes incomprehensible back-and-forth niceties uttered in any social encounter” (page 39.) Ta’arouf plays a central role throughout the book, with the author describing many of Iranian president Ahmadinejad’s interviews and actions abroad as a carefully-manipulated variation of this conventional social practice, meant to send a message to the Iranian public. I think that there might be a parallel with this practice and cultural practices of the southern United States, where it is a conventional practice to ask someone how s/he is doing in place of a traditional greeting, while never expecting a negative answer in return. Another social practice in Iran is that of the “Persian Walls,” as described in page 116. In this passage, the author describes the Iranian’s population support of their private space – where they are able to have personal liberty, including freedom of speech. It seems to me to be a similar belief in protection of private property and personal space in the American south. The book mentions many other interesting topics, including that of democracy in Iran. This book was written before the presidential election of 2009. Although the author offers a brief preface, I am still interested to know the current views (contentment/discontentment) among the Iranian population. Visiting your profile in Livemocha led me here. I'm an Iranian who lives in Tehran. I believe one consequence of our isolation is that people in the world are not familiar with our culture. They get a negative image through media, movies and some TV series. I appreciate that when I meet foreign people on the net, they behave me kindly like brothers and sisters. I'm not sure if I got "Persian walls" because I think everybody in the world respects privacy. I have to read the book though to follow it. Imagine that my friend is near my home and I'm talking to him. When we want to say goodbye, I tell him, "please come in and have dinner with me, please" and I expect him to reject this offer :D because I don't want any guests at that moment. I hope that one day, my country would have lots of tourist visiting there and exchanging culture just like other countries.